Hello, we are the team behind Wannabe Zen. 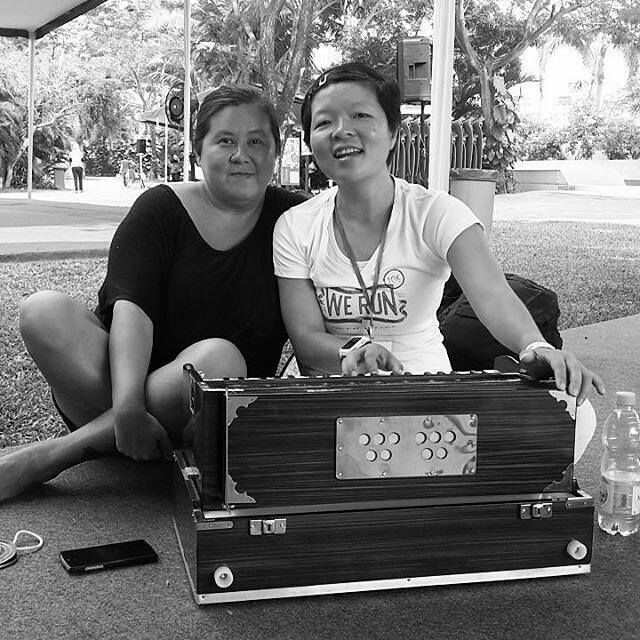 Christine (wearing black) & Silvia (playing the harmonium) in Anandamaya Festival, September 2015. I’m a yoga instructor and meditation facilitator. I’m into health & wellness, spirituality, good books, coffee, and endurance sport. I love learning and I found out the best way to learn is to share. This blog is an outlet for me to share what I’ve learned so far through teachers, friends, books, courses, trainings, and life experiences. I teach yoga in several studios around Jakarta, I also teach privates & groups. Email me at silvia.hendarta@gmail.com or WA 08156058887 for enquiries. I’m on Facebook, LinkedIn, Twitter and Instagram. I also have a personal website silviahendarta.com. Working in a distribution company and running a yoga center are basically what my life is all about. Jumping from one role to another role is quite draining of my physical and mental reserve, it is like bringing two sets of mask wherever I go. In finding balance between my two jobs, I stumbled upon getting myself certified with iRest (Integrative Restoration) Yoga Nidra, it is an evidence-based transformative practice that leads to psychological, physical, and spiritual healing and well-being. Thus, I get to see new view in life where every experience comes alive, the beautiful ones as well as the painful ones, the ones that uncover my strength as well as the ones that lay open my vulnerability . And so writing this blog is an old dream resurrected. I teach iRest Yoga Nidra at Bliss WellnessCo regularly, contact me for schedule and details. The best way to contact me is through email chrisprawita@gmail.com.